Organised by: Office of the Campus Director, Kuantan Campus, IIUM. CFS participated in tree planting activities for Humility Day No2/2019. As part of the Humility Day 2019, series 2 of the campaign was held on 7th March, Thursday with tree planting chosen as the main activity. 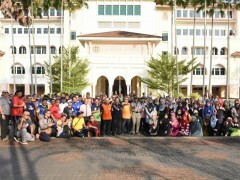 Approximately 1000 trees are provided for the event to be planted around Kuantan Campus. The event kicked off at 8.30 in the morning with simple exercises by the participants and followed by tree planting acitivites. The area focused on for planting trees were at Kulliyyah of Medicine, Kulliyyah of Pharmacy and Mahallah Talhah. As usual, there was a potluck session after all the hardworks and efforts by the participants. Humility Day No. 2/ 2019 tree planting activities focused on goal 15 of Sustainable Development Goals, Life on Land, which is to protect, restore and promote use of terrestrial ecosystems, sustainably manage forests, combat desertification, and halt and reverse land degradation and halt biodiversity loss.